Qualcomm revealed the name of its newest SoC, the Snapdragon 835, at its Snapdragon Technology Summit in New York today. The new SoC replaces the Snapdragon 820/821 at the top of its lineup. While Qualcomm is not yet ready to disclose the specifics about what’s inside the Snapdragon 835, it did confirm one important detail. 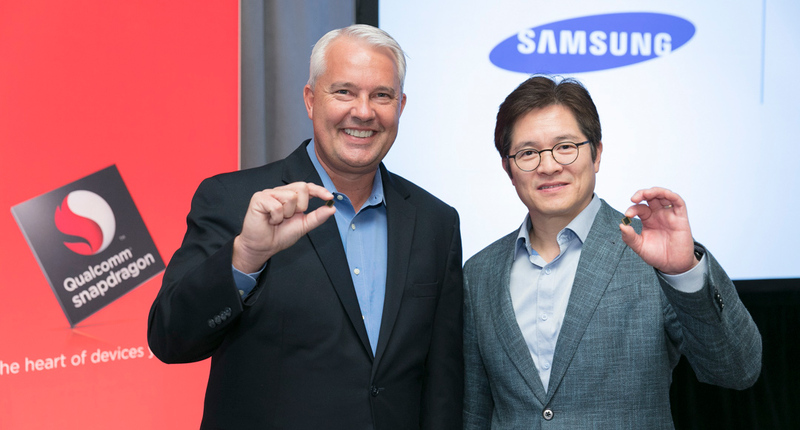 Keith Kressin, Senior Vice President of Product Management at Qualcomm, took the stage with Ben Suh, Senior Vice President of Foundry Marketing at Samsung Systems-LSI, to announce that the Snapdragon 835 will use Samsung’s 10nm "10LPE" FinFET manufacturing node. We do not know the Snapdragon 835’s power or performance numbers yet, but according to Samsung its 10nm process “allows up to a 30% increase in area efficiency with 27% higher performance or up to 40% lower power consumption.” The switch from 14nm to 10nm, along with other changes, give the Snapdragon 835 a smaller die size than the Snapdragon 820 SoC, and should also help improve battery life. The Snapdragon 835 is already in mass production and on schedule to appear in commercial devices during the first half of 2017.